Men’s wedding bands are no ordinary pieces of jewelry; they are a priceless purchase. You do not buy wedding bands for yourself every day, and so it is obvious you will feel unsure. Men’s wedding bands are available online and in local stores. The thought of purchasing one does seem easy. However, the reality is most men land up confused. There is a high possibility of them making mistakes. 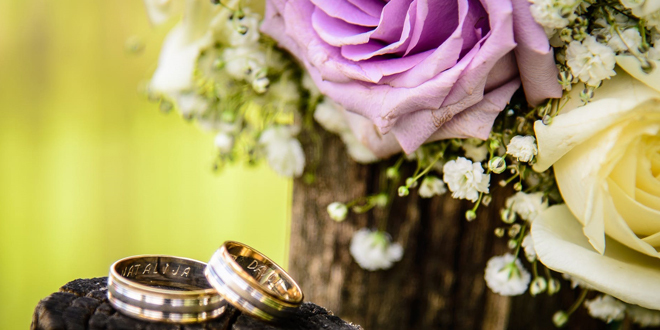 If your wedding is around the corner and you want to buy the right wedding ring, the following post will help you to avoid mistakes and make the right purchase. Men’s wedding bands – how to buy them right! You need to shop for your wedding ring; however, the first question that comes to your mind is how you should start? Most men are not sure of what they want. The wedding band you wear is a part of your image and personality. You should know what you are looking for and how it can help you make a perfect choice. It is prudent to understand what you like and prefer. Do you want a simple ring or are you fond of cool and trendy designs? The good news is you will find several wedding bracelets out there in the market. However, your purchase is a one-time investment, so do not make any mistakes! 1.Looks over comfort – When you are buying for your wedding band, check whether it is comfortable for your finger or not. No matter how good looking the ring might be, it should not be too tight or too loose. At the same time, you do not want the ring to form rashes on your skin- make sure it is hypoallergenic. When you are looking for the maximum levels of comfort, check the internal walls of the ring. It should be round and not flat. There should be some inner space that is just enough to make your finger get air. The band should be thick. When you are shopping on a low budget, do not fall for looks. Keep the above tips in mind. The edges should not be sharp. In case, the price is a constraint, opt for uncomplicated and simple wedding band designs. 2.Durability – The wedding band you wear must be durable, mainly if you work outdoors. The average thickness of men’s wedding band is approximately 1.5mm for cheap rings. If you are looking for comfortable rings, they are generally 2mm. High-quality rings are usually 2.3 to 2.7mm. If you work outdoors, go in for tungsten carbide or titanium rings. They are highly durable and will not chip or bend. Gold and platinum are soft metals and ideal for men in indoor office jobs. Your wedding band is a ring you will wear for decades. Keep this point in mind when you are buying men’s wedding bands. There are popular websites to help you get perfect wedding rings like https://www.mensweddingbands.com. 3.Design – The next common mistake men make when it comes to buying their wedding bands is the design. Experts in the field of wedding planning say it is prudent to keep your design as simple as you can. Do not go in for complicated designs. For instance, you may be fond of diamonds or precious stones. You want them on your wedding ring; however, keep in mind the fact that you need to work daily. You will be at your desk or maybe on the road doing your job. Precious stones might fall out of your ring and cause ugly hollows. You may not be able to find these stones. So, be prudent and go for simple designs. Opt for gemstones only if you have them solidly inserted. Big stones do not fall out as often as small ones. It is prudent to go in for cravings. They look elegant and sophisticated. 4.Maintenance – Ensure you do not land up buying a band that needs a high degree of maintenance. You want your wedding band to look as good as new. So, opt for a wedding band that is durable and has shone for many years. For instance, if you are indoors most of the time at home or work, opt for gold or platinum. However, if you are at work outside or exposed to a lot of water or extreme heat, be wise and opt for a more durable metal like tungsten carbide or titanium. Do not be disappointed if you cannot have gold or a platinum ring. These rings are equally amazing and the wide array of attractive designs you find in the market today will honestly impress you! 5.Price – This is the ultimate point you must pay attention to if you do not want to get cheated with a fake ring. No matter how cheap the wedding band is compared to others in the market, do not buy it. There are several duplicates and fake wedding bands being sold in the market today. Always carry out careful research and compare the different market prices online for wedding rings in all metals so that you make the right purchase. Thanks to the Internet, you can compare prices online quickly. You do not have to leave the comforts of home to make inquiries. Always buy a wedding band that is competitively priced in the market so that you effectively get a genuine product. It is a wise move to keep in mind, the above points when you are making your wedding band purchase for your big day. If you intend buying your wedding band from online websites, check their reviews and customer testimonials in the market before you make your purchase. You should invest some time when it comes to buying your wedding ring. Give yourself some time and never opt for anything that comes in your way in a rush. In this way, you will avoid mistakes and get the perfect wedding band for your special day!